The Wisconsin Section of the American Chemical Society is the second oldest local section in Wisconsin. Founded in 1907, the Wisconsin Section was formed shortly after the Milwaukee Section which dates back to 1906. The Wisconsin Section encompasses 10 counties in south-central and southeast Wisconsin. The leadership of the section and most active participation has historically been centered in Madison and the University of Wisconsin-Madison; however, in recent years active participation and section leadership has included members from outside the Madison area, most notably from Platteville and UW-Platteville. The Wisconsin Local Section Bylaws are available online. Local members can now join our community in Google+. We plan on using the community to collaborate and share ideas with other chemistry teachers in our local section, distribute opportunities for educators that are associated with the ACS, and allow educators to collaborate with leading industry professionals and professionals in chemistry. We warmly welcome and strongly encourage active participation from all of our members. Please check this website regularly for news about section activities and contact us with any questions. 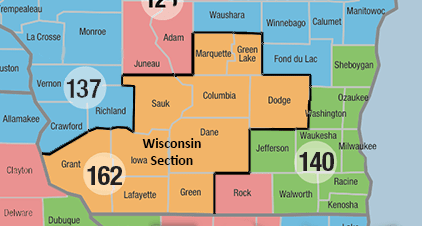 The Wisconsin Section is part of the ACS Great Lakes Region and Electoral District V. It is labeled as section 162 on the full map of ACS Local Sections.